March: and many thanks to follow – AWP news, mostly. But first, our “secret poem”: Susan Stewart’s beautiful “Snow Fort” and “”Hay Fort,” astutely and lovingly introduced by Plume contributor Sharon Kubasak. “Come in.” Simple, stark, startling. The words interrupt me with intimacy. “Forms of Forts”: of sheltering. “Hay Fort” and “Snow Fort”: I must slow down and I must keep moving. In the hay fort, I feel precipitous and pending: “an object to be awakened.” This potential, this conjuring projection into time arcs into winter ending and “broad day” bursting into a “swath” of seeing the rare and random components of the hay. But discovering this buried treasure also disenchants, and awareness again unsettles: “you must choose between the living and the dead” and the labyrinth no longer itself, once disclosed. Still, what the mind recognizes, it also revises or resists. Ultimatum is compromised by hope. And it aspires: “That there might be something when there is nothing /and the source of light confused with holiness.” I am left with the risk of immanence daring me to wish, believe. “Come in”: urgent and necessary, almost, for me like a credo since I first read this poem. The directness is bare, arousing, “a cavern in the white / heart,” making seem uncomplicated what is so difficult, at times, to say or do. But it is also, I now realize, an entrusting tripling of proximity to what already seems so close. “Come in, come here, come into.” I have travelled the illuminating “pencil shaft” to the clarifying “swath // of sunlight” to its threshold—the mysterious “source of light confused with holiness.” I have been prepared for this snow fort of faith “braced for us / against the collapsing rain.” And I am ready to partake of its offering: “Come in / where the silence is like breathing / moonlight.” And in this act of silence, I am child and adult, rendered, it seems, and momentary. And I delight in the wonder of my impermanence, and I know an intimacy that is vast. wherever four bales couldn’t squarely meet. The twine tight, lifting as abrading. a scratching rash along the forearm. The heaviness of the hay in the hot dark. where before there was nothing. an object to be awakened. was bound and pressed into the hay. you must choose between the living and the dead. or worn away at its foundations. and the source of light confused with holiness. Susan Stewart is a poet, critic, and translator. 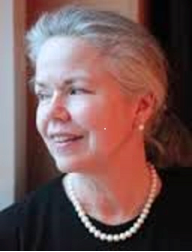 Her five books of poetry include The Forest (1995), which received the Literary Award of the Philadelphia Atheneum; Columbarium (2003), which received the National Book Critics Circle Award; and, Red Rover (2008), also published in Italian translation by Jaca Book in Milan. Her collection Cinder: New and Selected Poems was published by Graywolf Press in February 2017. A former MacArthur Fellow and chancellor of the Academy of American Poets, she teaches at Princeton University. Sharon Kubasak’s poetry and poetry reviews have appeared in Plume, Field, The Bitter Oleander, Verse, The Plain Dealer, Cloudbank, and other journals. She is the recipient of an Individual Excellence Award from the Ohio Arts Council and teaches at Baldwin Wallace University. Wonderful, I think – and I especially like the appended note from Susan Stewart on Merleau-Ponty’s Phenomenology of Perception, a book I carried around for months, to be read on buses and on a bench at Carl’s Car Wash, where I was gainfully employed for a few months, age 19 or so. My colleagues called me “The Professor,” mostly derisorily, but still, part of me liked it. 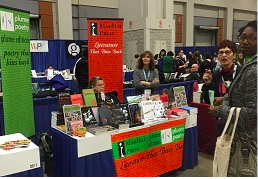 First, the Plume staff, who did practically everything (setting up and manning the booth, catering, arranging sound and such) and without whom this would not have gotten off the ground, believe me: Marc Vincenz, Nancy Mitchell, Hélène Cardona, and Adam Tavel. But also F.J. Bergmann, Leeya Mehta, and Sally Bliumis-Dunn, not forgetting my (smart, funny, beautiful, of course) wife, Donna Lawless. A big shout out to Tedd Determan for finding our venue for three nights – The Atrium at the Mount Vernon Place United Methodist Church – stone walls, soaring ceiling, glass enclosed – as D. Nurkse noted, “like being inside and outside the same building at the same time.” Surely one of the most beautiful sites we’ve ever been privileged to engage – I can’t imagine we’ll find its equal in Tampa next year, but we’ll try. Though I’m not a fan of large conferences generally (which probably has more to do with me than them), it was good to match names with faces, to have a drink and get to know one another a little. I think I spoke at length to a few of you – Chard, Michael, Todd, Sally – but even a quick introduction was a delight: I now have your corporeal presences in my mind, and will again when I write, no doubt asking for something or other. I’m sure we’ll be present in Tampa in 2018 – just across the bay from us in Saint Petersburg – and will be hosting readings there. But before that, we will be holding readings in support of the new anthology – Boston, NYC, elsewhere. Don’t be surprised if my name appears in your inbox, asking if you might like to join us. Speaking of the new anthology – see below, again. If you like, purchase a copy for yourself, a friend – or as some already are doing, order in bulk for your writing class (with attendant discount). Available through our Store on the Plume homepage, MadHat Press, Amazon, B&N, et cetera. 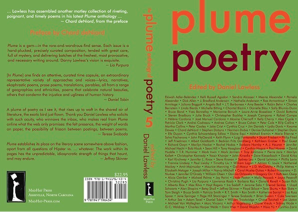 Also available at those sites, Plume Interviews, a compilation of Feature Selection conversations with Nin Andrews, Christopher Buckley, David Clewell, Cynthia Cruz, Jim Daniels, Tess Gallagher, Ani Gjika, Hank Lazer, Luljeta Lleshanaku, Amit Mujmudar, Lawrence Matsuda, Thomas McCarthy, Emmanuel Moses, D. Nurkse, Max Ritvo, Ira Sadoff, Adam Tavel, Jean Valentine, and Marc Vincenz.Edited by Nancy Mitchell, with some small contributions from me; interviewers include Ms. Mitchell, Ani Gjika, Hélène Cardona, and Glenn Mott. We are working on our long overdue reorganization of our Search and Archive tags – soon, you will find we have dates and issue #s to accompany all present and past poems. 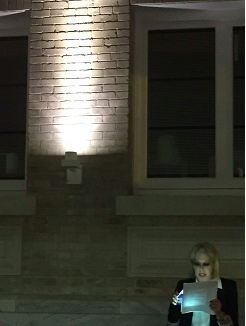 I’d be gravely remiss if I did not extend a personal note of gratitude to Ariella Riva Ritvo for her generosity and general kindness to Plume, in the name of her son Max Ritvo, whose absence from our midst is felt keenly, always. 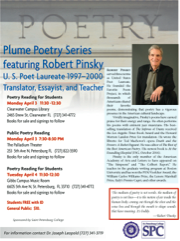 If you’re in the neighborhood, the fifth annual Plume/SPC Poetry Reading will feature Robert Pinsky, April 3-4, in Saint Petersburg, Florida. Penultimately, in this issue’s Editor’s Note, you’ll be relieved to find I have ceded my place to Chard DeNiord, who bids farewell to his long-time friend, Tom Lux. 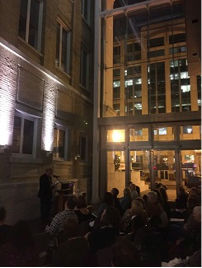 Tom was to read at AWP for us, but, as you know, could not. In his stead, Chard read several of Tom’s poems, and… sadness is part of magic, too. Read the essay; illuminating and profoundly, almost unbearably moving. Our cover art this month grows out of a conversation I had with Michael Anania at AWP, somewhere in which, in lamenting those lost voices of poets we both loved, the name Blaise Cendrars came up. As you may know, Cendrars was the first exponent of Modernism in European poetry, indeed perhaps was its first great poet. His works include, most famously, La Prose du Transsibérien et la Petite Jehanne de France (1913). 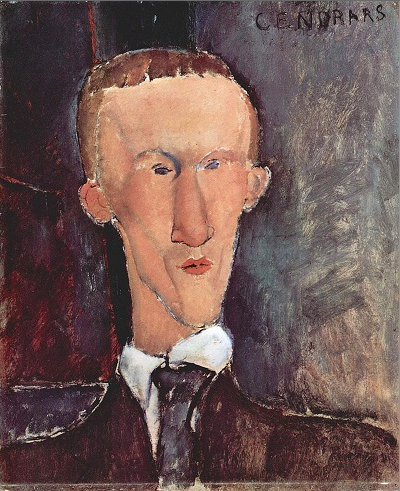 The painting is by Modigliani, the Italian–born sculptor and painter (1884-1920). That’s it for now, I think. Sherrard, Buckley, Collins, et. al.